Tamilnadu Government proposed to convert OMR (RajivGandhi salai) to IT Express Road. It necessitates providing water supply and sewerage infrastructure prior to formation of IT Express Road. While contemplating the demand for water supply/sewer for the ultimate demand of the year 2036 was considered for 12 suburban nodes and industries/consumers along IT Corridor. Number of IT Firms, Educational Institutions like Engineering, Medical, Polytechnic etc. are developing along IT Corridor. Rapid development, fast growing population warrants potable water supply to consumers along IT Corridor. Starts from the junction of Sardhar Patel Road and Central Polytechnic Road (Madya Kailash) to Thiruporur. Sub-urban Nodes along IT Express Road - 12 nos. From Kottivakkam to Siruseri – Present Proposals. For early completion of works and in order to cope up with development works of IT Express road by TNRDC, the work has being implemented in 5 Packages for Sewerage works and 2 Packages for water supply works simultaneously. Laying Gravity Sewers for collection of sewage from consumers abutting IT Corridor and pumping main form Kottivakkam to Siruseri (Gravity – 34.545 km.,Pumping Main – 12.381km.) for convey sewage from Sewage Pumping Station to Sewage Treatment Plants. Work is being implemented in 5 packages. Construction of IMLD Water Distribution Station at Kelambakkam. Laying 100 mm dia DI Distribution Main on both side of IT Corridor from Kottivakkam to Siruseri – 27.0 km. Laying 500 mm dia DI conveying main from Kelmabakkam to Pallipattu – 31.10 km. 5 Status Of Work Work Completed and Commissioned. c)Construction of sewage pumping station - 14 Nos. Land for STP Navallur and Sholinganallur ’s has been identified and enter upon permission issued by the Govt. NAVALLUR: DPR for STP approved, NIT issued. Tender received and evaluation under process. 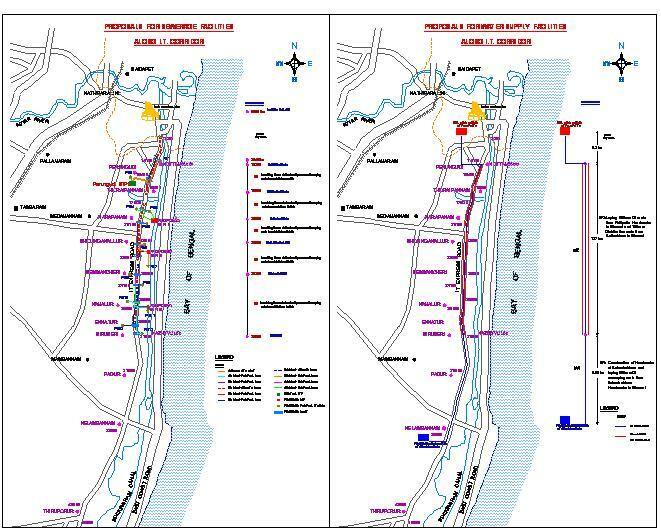 SHOLINGANALLUR: DPR for STP approved, NIT issued. Tender received and evaluation under process. Laying 500 mm dia Conveying Main from Kelambakkam to Thiruporur. Laying 100 mm dia Distribution Mains and branches from Siruseri to Thiruporur on both sides of IT Corridor. Connecting water mains with a building urban nodes water supply system. Laying Gravity Sewer and Pumping Main from Siruseri to Thiruporur. Construction of 6 sewage pumping stations. Construction of 2 Sewage Treatment Plants. Connecting gravity main with urban nodes sewage collection system.